In 2009, London Borough of Tower Hamlets appointed Quarterbridge and GL Hearn to prepare a Street Market Strategy including a review of all street market activity, a retail planning strategy and regeneration proposals for the ongoing improvements and success. A strategic review of all Tower Hamlets Street Markets including: Bethnal Green Road, Brick Lane, Chrisp Street, Columbia Road, Petticoat Lane, Roman Road, Watney Street, Wentworth Street and Whitechapel Road. The report established a retail turnover associated with the markets in excess of £20m p.a. Making LBTH Street markets one of the largest retailers in the Borough. Marketing the Markets including joined up thinking and consideration to LLA. Strategic Proposals for the Markets to serve the local community and attract tourism. One of the key proposals was to create a MARKET MILE, establishing a walk for market visitors to include some of London’s most iconic markets. 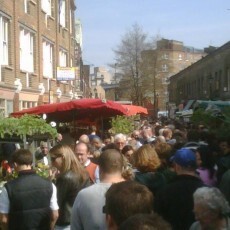 Visitors are guided from Liverpool Street Station (Bishopsgate’s Exit), through Petticoat Lane, Wentworth Street, north along Brick Lane and ending at Columbia Road flower market. The proposal included for marketing, signage and encouraged shoppers to stay from the set path to help boost the economy of neighbouring businesses. Other initiatives included the ongoing development of Wentworth Street as a place to gather for lunchtime street food and a new covered market tensile roof for Whitechapel Road Market. Markets play a key role in the regeneration of our high streets and the socio-economic prosperity of our towns and cities.